Hello, and welcome to Random Things I Own! This is exactly what it sounds like: A list of possessions that I have lying around for no apparent reason, along with gratuitous explanations of what they are and why I have them. 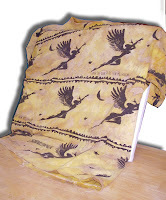 These items have little monetary, sentimental, or even intrinsic value. They're just Random Things. If you see anything you like, make an offer. That's right - any of these fabulous objects could be yours. And then, like miniature works of art, they would transform into Things You Stupidly Bought, and you can put them on your own damn website. OK? OK! 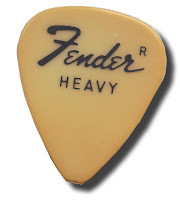 My dad gave me this guitar pick. The guy who gave it to him said it was used by John Oates (of Hall and Oates fame) in concert, and he threw it into the audience. But I don't know if that's true. I mean, it doesn't have any of his famous mustache hairs clinging to it or anything. It is a guitar pick, however, and it peforms the essential function of producing a sound when pulled across one or more guitar strings extremely well. Note: I think it was white when I first got it, but it has since acquired this handsome patina, just like a piece of real ivory or cheap plastic. I've had this since I was a very, very small person. 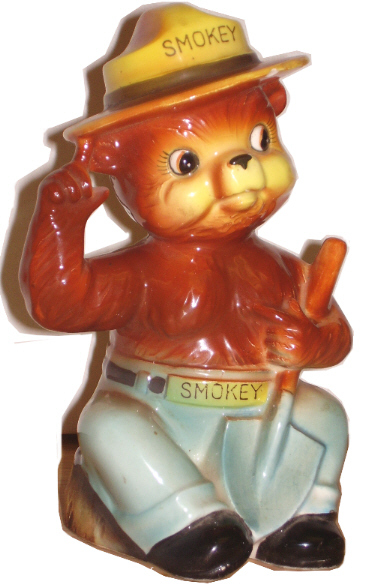 I used to put money in the little slot in Smokey's back, and I must have taken money out just as often, because the rubber stopper in the bottom looks as if a child's grubby fingers spent hours repeatedly prying it loose and then guiltily wedging it back in. Thus are our early financial habits formed. Smokey's got a small chip in his ranger's hat, but otherwise he's in pretty badass shape. This is in fact the only Random Thing here that does possess certain sentimental value, albeit not much, as he was living in a moldy box in the garage when we stumbled across him while putting away Christmas decorations. Bobby Witt was a starting pitcher for the Texas Rangers from 1986 to 1992 and then again from 1995 to 1998. He had a strong right arm and a cute face, and despite being wildly inconsistent (a league leader in both walks and wild pitches during his career), he was extremely popular. My Beloved Spouse and I got to meet him and several other Rangers pitchers during a charity event run by a friend's grandmother. Grandma was an accomplished con artist, and who knows where the funds she raised actually ended up, but it was pretty exciting to meet these famous local athletes whose agents had no clue what kind of shady deal they had signed up their clients to attend. But that's another story. 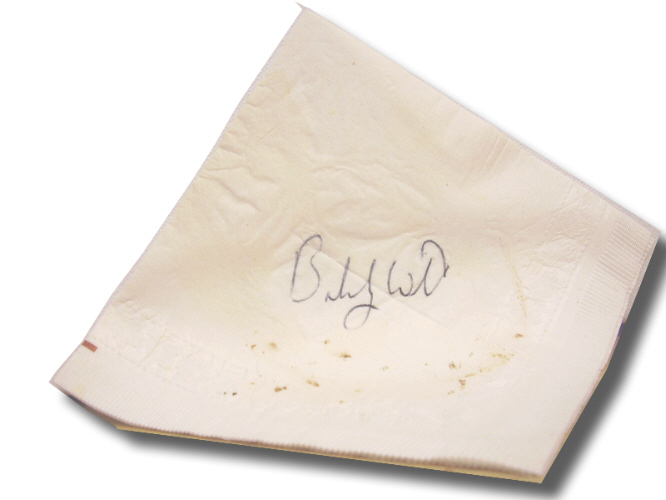 I got Bobby Witt's autograph on a napkin, and somewhere there's even a photograph of me and Bobby and my very goofy early 90s hair. I checked online, and this authentic signature is worth upwards of six bucks. BelSpouse and I saw a double bill of Jeff Beck and Santana in concert. Neither one of us is a big Santana fan (Beck actually blew him off the stage, if you ask me), but he had the cooler T-shirts for sale, so that's what I bought for BelSpouse. As you can see, it's kind of a gold tie-dye with tastefully drawn naked chicks and moons and stuff. The problem is, BelSpouse still wears this shirt. Even though he's had it since 1996. We bought a house in 1996 that we got rid of years ago. This shirt is older than our daughter and several of our nephews. It's not in bad shape, as old T-shirts go (especially compared with some of the rags I've had to sneak out of his dresser in the dead of night to prevent him from wearing them), but damn. More than anything on this list, I find the continued presence of this shirt in my home baffling. 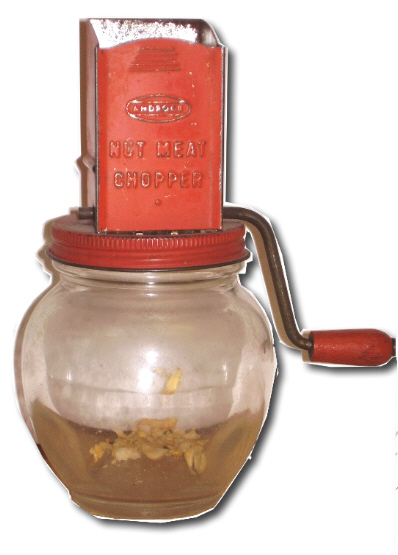 Say it with me: it's an antique nut meat chopper. For chopping your antique nuts and/or meats, I suppose. This baby is made of breakable glass and corrosive metal, not like those sturdy dishwasher-safe plastic Slap-Chop contraptions. You put your whole nuts in the tiny little hopper, you turn your crank, and your indifferently ground nut meats fall to the bottom, most likely to be re-chopped with a sharp knife. Because as far as I can tell, this thing is damned ineffective at chopping nuts. But it's a funky old kitchen gadget. There must be a family-style restaurant somewhere that needs another rusting piece of crap to put on a shelf in lieu of actual decor, amiright? And that's all for this edition of Random Things I Own. I'm going to find a drawer to stuff this crap in. See you next time!